With last week being such a busy one it has been nice to get back to some sort of normality. 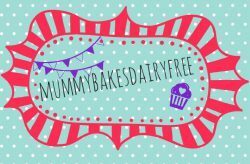 It means I can get back into the kitchen and not worry about baking cakes (Although I’m sure It won’t be long before I’m baking again)! The focus of the last few weeks being on birthdays and BBQs, my store of freezer meals has been a little depleted. Cooking in large batches is a great way to create a bank of freezer meals for both little one and myself and my husband. I really enjoy creating healthy, filling meals for only a few pounds, so the fact I can make a number of dinners out of one dish is a bonus. 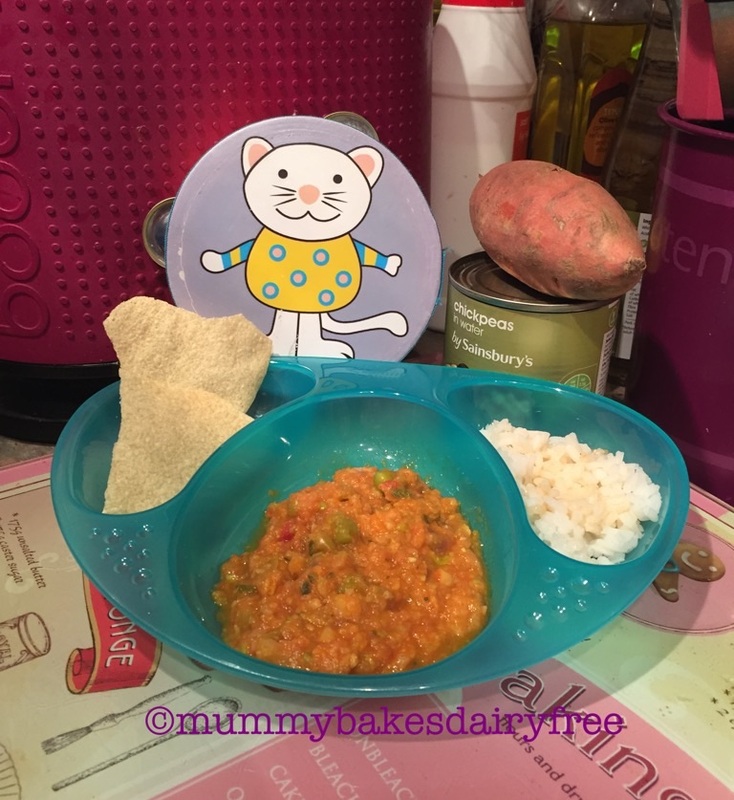 This is a mild, tomato based curry which my little one loves. I mash it down a bit for her and serve it with rice or pasta, cue mealtime fun with self feeding and rice! The recipe is so versatile and is great for using up any vegetables in your kitchen. This is a veggie recipe however I have added chicken previously and it’s worked really well. Chunks of cod and prawns are delicious also, basically whatever I have in the fridge. 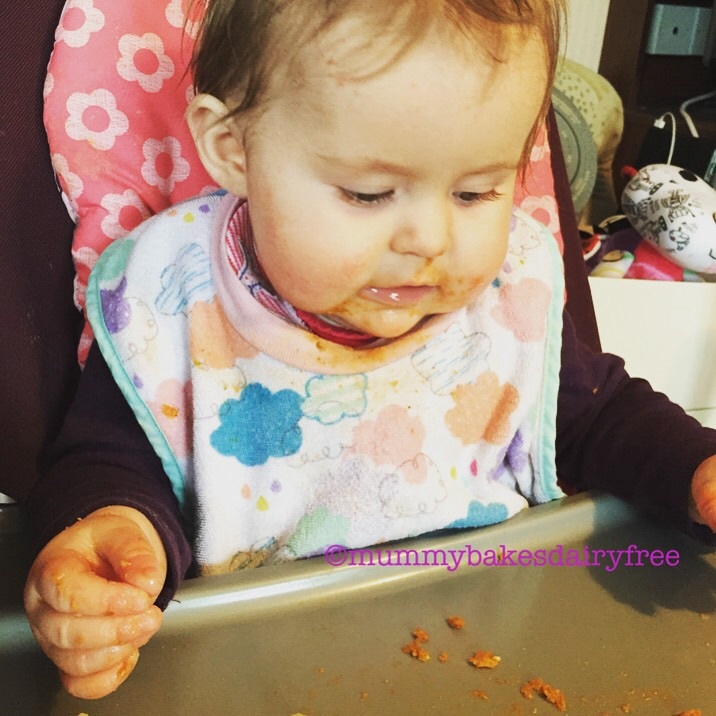 I’m keen to introduce little one to a range of flavours from a young age so that she develops a love of different cuisines (well that’s the theory)! Little one enjoys mild spice but I must admit I do add a stronger hit chilli to the grown up portions after I’ve served up her’s. 1. Heat the vegetable oil in a large saucepan over a medium heat. Add the sweet potato, onion and garlic and cook until softened. This may take 15 minutes but it gives the sauce a better flavour. 2. Stir in the tomato purée and garam masala spice mix and cook for 5 minutes. 3. Add the pepper and courgette and cook for a few minutes until softened. 4. Pour in the plum tomatoes and half of the can filled with water. Bring to the boil and then turn down to a simmer. Cover with a lid and leave for 20 minutes to simmer gently. Make sure you stir occasionally, adding a little water if it looks dry. 5. Next add the chick peas, cauliflower and peas. Turn the heat up again to keep a gentle bubbling going. Cook for another 15 mins or until the cauliflower is tender. Add a little water if needed to prevent the curry from sticking. 6. I now take out my little one’s portion and add some chilli to the remainder of curry to give my portion a kick. Previous Post A Birthday Week!